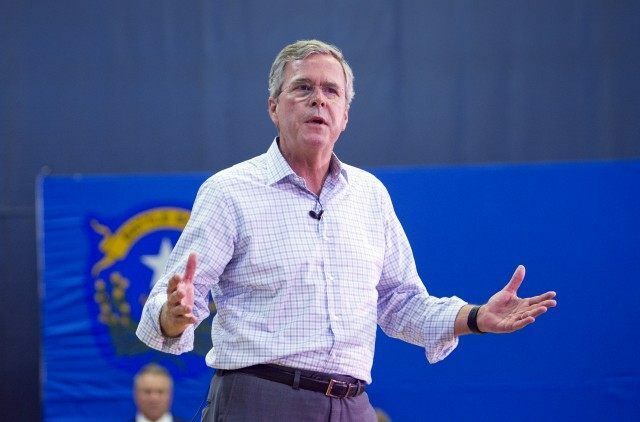 Republican presidential candidate Jeb Bush says his fellow 310 million Americans just can’t build a wall along the 2,000-mile border with Mexico. “What Donald Trump is proposing is a wall that can’t be built,” Bush said in a Sunday radio interview with John Catsimatidis on New York’s AM 970. Bush’s declaration of American helplessness comes 70 years after the United States built two nuclear weapons to end the bloodletting in World War II, 65 years after the United States built a huge military to win the Cold War, 59 years after the U.S. government began building the 161,000-mile National Highway System, and 46 years after the United States built rockets to take Americans 120,000 miles to the Moon. Bush’s insistence on Americans’ inability to build a concrete-and-metal wall comes 408 years after early Americans settlers built a wall around the town of Jamestown, or roughly 500 years after Chinese people hand-built the 5,500-mile Great Wall to exclude undocumented Mongols, or roughly 8,000 years after laborers build the first walls of Jericho. Bush’s “We Can’t Do It,” mantra contrasts with Trump’s “Make American Great Again” slogan. So far, the public seems to prefer Trump’s confident vision to Bush’s passive, pessimistic vision. A new poll of Iowa voters shows that 23 percent of voters support Trump, and six percent support Bush. “If it was [built], it would cost hundreds of billions of dollars,” he insisted. Bush’s calculations predict that each mile of border fence would cost at least $100 million to construct. It appears Bush may have exaggerated the cost of the wall that can’t be built. Experience shows that walls are much simpler to build than spaceships and rockets, nuclear weapons, or a huge military. In fact, the Government Accountability Office concluded in 2009 that the most ambitious border wall under consideration would cost $5.1 million per mile. In other interviews, Trump has pointed out that the United States spends roughly $100 billion a year aiding — and occasionally, repatriating — its resident population of 11 million illegal immigrants. The Trump border wall would reduce the inflow of expensive illegal labor, cut federal spending, and also give American families a better chance of earning higher wages.